This vegetable broth-based soup is the perfect cure for what ails you. 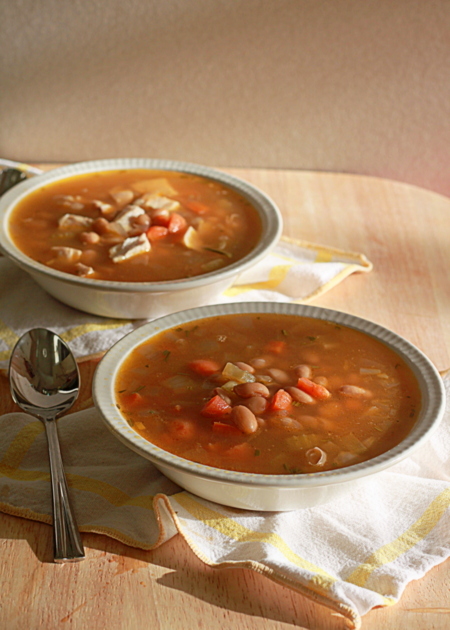 I think of it as the perfect vegetarian substitute for sick-day chicken noodle soup; of course, you can add back the chicken to a portion for the meat-eaters. Either way, it’s light yet hearty – and simply delicious. I sort of thought I’d avoid all the family ailments that come along with having a toddler, because our little one isn’t in daycare at the moment. Ha! I was so naive, in so many ways. So many many ways. Turns out thatstory times and music classes and Target all have lots of those lovely little germs and our little girl is picking them up right and left. Therefore my guy and I are subsequently picking them up right and left. I’m all for powering up her immune system, so, you know, it’s all good when they’re just back-to-back minor colds. And us adults are learning to live life with a perpetual case of the sniffles as well. Goodness knows it’s all worth it, 100 gazillion times over. 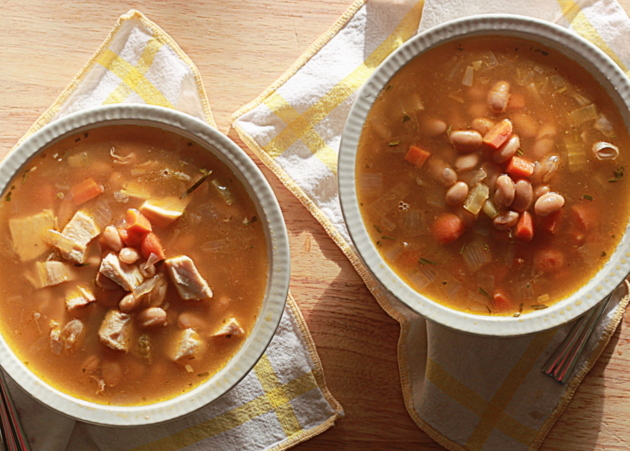 When a cold really gets us down, though, nothing hits the spot like a piping-hot bowl of brothy soup. I have a chicken noodle/just plain noodle soup I like to make, but lately I’ve been turning to this one instead: rosemary white bean soup. I don’t know if it’s the nice light vegetable broth, the good strong hit of rosemary, or the nice bits of garlic with its medicinal goodness, but this soup works some great chicken-noodle-soup-like magic on a bad cold. It also works magic on a nice, chilly evening with some crusty buttered bread alongside – even when everyone’s perfectly healthy. Or as lunch on a blustery afternoon. Or packed in a thermos to sip after a long walk on a cold beach. I haven’t done that, but it certainly sounds marvelous, so maybe I should (well, maybe after I get over this dang nagging cough). In a medium saucepan over medium-low heat, add the olive oil (and butter if using) and cook until melted. Add the onion, carrots, and celery, and cook, stirring frequently, until tender, 5-6 minutes. Gently stir in the rosemary, garlic, and beans, and cook for another minute. Add broth. Increase heat to high and bring to a boil. Lower to a simmer. Cover and cook for 20 minutes. Transfer about 3 cups to a separate saucepan and add chicken. Bring to a simmer. Serve. 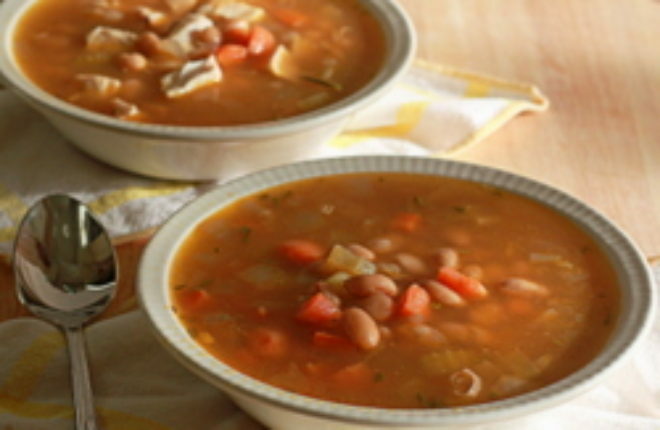 Mmmm, love this hearty wintery soup! Rosemary is one of my few surviving herbs at the moment (that and the parsley that just will not die–not that I’m complaining! ), so this is going to have to go on my make soon list. It is definitely soup season! 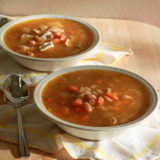 Such a hearty and warming soup! Perfect for the cold snowy weather we have over here. The recipe list calls for 5 cups of vegetable broth, but in the directions it reads add 3 cups of broth and bring to a simmer. What happened to the other 2 cups of broth? Hi, thanks for asking – that was a typo. Fixed! You should put in all of the broth at once.